yep ! the colors of the sky and the frog are amazing ! very nice work. So cool to see this view! I spent some weeks climbing in Ecuador in the ’90’s. We spent a couple of snow-bound days on the glaciers of Cotopaxi and never managed to reach it’s summit. Such a gorgeous mountain!! AMAZING. looks like a painting. You’ve got a crazy, amazing eye for photographs! I love this sunrise. My biggest regret in life is that I am not well travelled. Your image really show me some of the most wonderful sight’s that I’m missing out on. Really inspiring work and exceptional Photography. Thank you Lee, much appreciated. It is never too late to travel and it’s a big world out there! Wow, amazing landscape ! Great light and tones ! 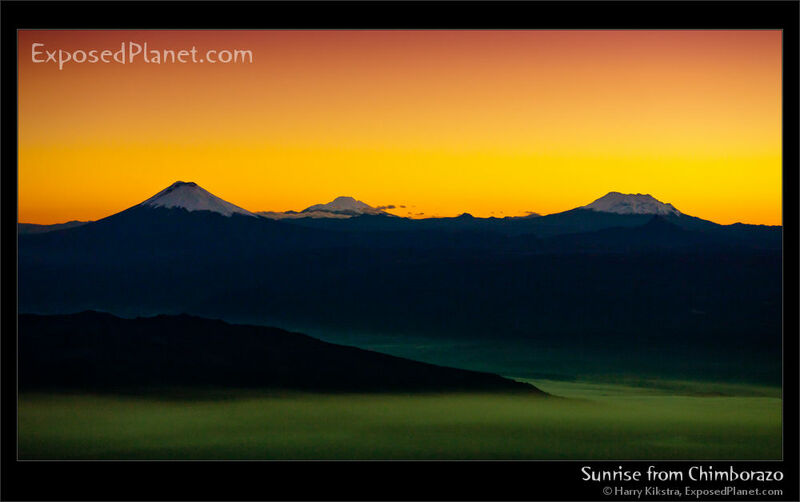 The story behind "Sunrise from Chimborazo, Ecuador"
This image was shot in the early morning at the point farthest away from the center of the earth -> Mt Chimborazo in Ecuador, just before sunrise.